Description: I commissioned Sergio to paint this piece, and the only request I had was that it contained the figure of Justice holding her scales and sword. 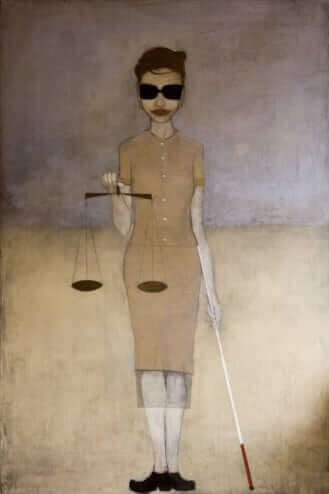 Rather than paint the traditional blind folded lady with the falling robes and the sword in her right hand/scales in her left hand, he drew this mod blind woman who carries the scales in her right hand and her cane in her left hand. It truly is a very creative piece that generates a large amount of comments in the lobby in our office.